This is part 4 of a multipart series, the previous post is Bitsquatting PCAP Analysis Part 3: Bit-error distribution. This blog post will examine the source country distribution of packets in the bitsquatting PCAPs. To map a source IP address to a physical location, we will use MaxMind's free GeoLite Data (available at http://dev.maxmind.com/geoip/geolite) as the data source, and write a quick Python script using pygeoip to do the IP-to-location translation. The pygeoip page on github provides all the necessary usage examples to create an IP-to-country script. My script, which reads in IPv4 addresses line-by-line on from a file (or stdin) and outputs an "ip:country:city" mapping is available here: ip_to_city_country.py. The first step to mapping source country frequency is to identify source address frequency. While the source address frequency is only an intermediate step to gather source country distribution, it is very handy for a manual analysis of where queries are coming from. The results for the frequency of all source IPs (ips_all.txt, 848KB, text) and only IPs not requesting 0mdn.net (ips_nomdn.txt, 740KB, text) are available for download. These intermediate results show how many packets were received from each IP. The list is interesting in its own right. The top few results are an unresponsive IP in Poland, IPs with PTR records pointing to subdomains of rscott.org (possibly in related to http://rscott.org/dns/ ? ), an open-recursive namserver at a Russian ISP, a resolver for LeaseWeb, and an MTA for WindStream Communications. Feel free to investigate more on your own. To find the frequency of source countries, each address will be mapped to its origin country. Only unique addresses, not how many packets were received from each address, will be counted for the distribution. Some shell commands and the ip_to_city_country.py script will identify the source countries. In the commands below, gcut, the GNU version of cut is used since the default cut on Mac OS X cannot handle non-ASCII characters. The <error> field means the MaxMind GeoLite database did not have an entry for the particular IP address. The large numbers for the US is likely due to the US-centric nature of many of the domains I bitsquatted, such as fbcdn.net, and the fact that the US just has considerably more IP allocations than other countries. The extensive world coverage of bitsquatting queries is really quite amazing; there are queries from 192 of the 250 countries in the MaxMind database. This is the third post in a multi-post series. The previous post is here. Which bits are more likely to be affected by bit-errors? What does the bit-error distribution look like? In this blog post, I will attempt to answer those questions by looking at bit-errors in the requested record type field of DNS queries. This post actually raises more questions than it answers: the bit-errors of the record type field are not distributed uniformly (the distribution one would expect from a random process), but instead mainly occur in bit 6 of the requested record type. I don't know why this is the case. I also don't know if this is only true for the record type field, or if this extends to the query name field as well. If you have any good suggestions, please contact me. The 7th most popular record type is 513. Type 513 is not mentioned in the Wikipedia list of record types, and it is not in Wireshark's record type list. Why are there 4835 requests for an undefined record type? This value is only one bit away from 1, the A record request type. Other requested record types in the top 15 share this similarity: type 1025 and type 257 are both one bit away from type 1. In the full query types table there are other requests with this property, such as requests for type 65, 2049, 16385. Note: some entries are blank due to overlap with other popular record types. Unpopular/deprecated record types, such as RP, were included in the count for bit errors. All query type overlaps are noted in the notes column. The count column is how often record type was requested. The unique count column is how often each record type was requested from a unique source IP. This was done to minimize the effect of one bit-error repeatedly manifesting itself via many repeated requests. After getting the (source IP, query type) pairs, a bash for loop can show us how many unique source IPs requested a certain record type. 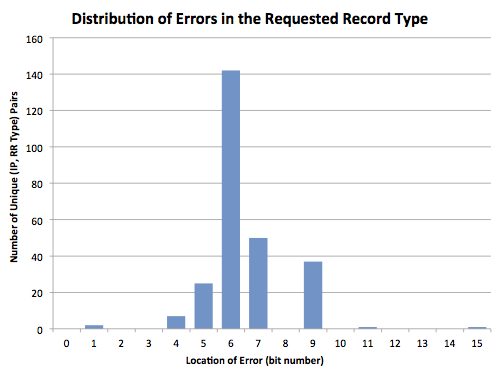 Counting only record requests by unique source IP address shows that the same error-prone query is repeated many times from the same source, but the overall distribution stays the same. There has been much speculation about bit-error distribution and if any bits are more likely to be affected. Judging by bit-errors of the query type field some bits are considerably more likely to be affected: bit 6 accounts for the vast majority of bit-errors, with the error rate dropping sharply with distance from bit 6. This distribution is evident in the query type field; I have not verified if it still holds in the query name field. I don't know why the distribution is as skewed as it is. Maybe the distribution is an artifact of the query type field and typical allocation alignments? Other thoughts and ideas are welcome. There are nearly as many AAAA record requests as there are A record requests. Do bit-errors of AAAA requests exhibit the same distribution? There are only ~24% as many sources of AAAA requests as there are of A requests. Still, this would only account for ~76% of the difference in error rate. The bit-error distribution, at least with respect to the requested record type field, is not uniform. It is centered at bit 6 and sharply falls off with distance from bit 6. I don't have an explanation as to why, but I suspect might have to do with packet alignment in memory. Other possibilities include errant networking equipment or software somewhere on the Internet. Any ideas and suggestions, especially testable ones, are most welcome. There are also more bit-errors in A records requests than AAAA record requests. The fact that there are fewer sources of AAAA records accounts for a part of this discrepancy, but does not completely eliminate it. If you have any insight, please contact me. Part 4 is now up, Bitsquatting PCAP Analysis Part 4: Source Country Distribution. This is the second post in a multi-part series. The previous post is here. In this installment of Bitsquatting PCAP analysis we will make an educated guess about the prevalence of IPv6 on the Internet, which services DNS is used for, and identify some mysteries in the bitsquatting PCAPs. All of this information is going to come from just one field: the requested record type of each DNS query. First, some background on DNS record types. DNS is essentially a distributed hierarchical database. Values are retrieved by specifying a location and a record type. The location is a fully qualified domain name. The record type is one of several defined record types. The most commonly requested record type is A, which means IPv4 address. When you are using IPv4 and translate www.google.com to an IP address, you are retrieving the A record for www.google.com. The above command says: ask my local name server (usually specified in /etc/resolv.conf) for the A record for www.google.com. And output the result in short form. Note: the IP addresses returned for you will likely be different. Google attempts to direct you to a physically closer server based on the geo-ip location of the requesting DNS server. This is one part of how most content delivery networks work. More in a future blog post. What is DNS used for? The full record type frequency table is available: (all_qtypes.txt, 408B, text). The table below shows the top 15 requested record types. Amazingly, the most requested DNS record type is IPv6 address resolution! Considering that other places measure IPv6 DNS traffic at only 15% of web traffic, something is definitely amiss. More on this after the discussion of DNS use. Name resolution is by far the most popular use of DNS. Name resolution is responsible for the first, second, fourth, and seventh most frequently requested record types. Amazingly there is a very high frequency of deprecated A6 records. Can there really be that many old BIND servers out there? Along with MX, the other records commonly used for email are TXT (to hold SPF and DKIM data) which is the tenth most frequently requested, and SPF (used for SPF data) which is the fifteenth most frequent. The fifth, sixth, and eighth most frequently record types are used all used for DNS infrastructure purposes. The ANY record type simply retrieves all available records, the SOA record type specifies who is the primary source for information about the domain, and the NS type specifies nameservers that can be used to answer queries about the domain. The next most commonly requested record type, SRV, is used for custom protocol related records. In practice, most SRV queries are used to retrieve information for Jabber/XMPP and other messaging services, including VoIP/Videoconferencing services. Finally PTR records are used for reverse DNS lookups. A reverse lookup is performed when you want to map an IP address to a domain name. This is one of the few (maybe the only?) time when you will encounter the .arpa TLD. ARPA originally stood for the Advanced Research Projects Agency, the US Government agency that funded the creation of the Internet. These days .arpa has been backronymed to Address and Routing Parameter Area, and what used to be ARPA is now DARPA. The returned domain is not www.google.com, but this is due to Google's infrastructure. There is a clever easter egg in the domain: 1e100 means 1.0 × 10100, which is one googol. What can we learn about the prevalence of IPv6? The full list of record types and their frequencies is available: (nomdn_qtypes.txt, 379B, text). The new table is a much different picture with regards to IPv6, but there is still a large amount of AAAA record requests. Lesson Learned: There are enough AAAA record requests to indicate IPv6 connectivity is important. If you are attempting to re-do the bitsquatting experiment, have IPv6 connectivity and answer AAAA requests! What is the nature of IPv6 traffic (AAAA record requests)? The full list of AAAA query frequencies is available: (AAAA_queries.txt, 17KB, text). The two authoritative name servers receive the most AAAA requests, but there are other domains with numerous IPv6 lookups. Maybe these domains are just popular? The ratio of IPv4 address resolutions to IPv6 address resolutions will show the proportion of IPv6 traffic for each domain. This measurement should completely disregard popularity, as it uses ratios instead of absolute numbers. My hypothesis was that the ratios should be approximately the same for all domains, as none of the domains I bitsquatted were IPv6 related. Lets calculate the ratios. The full list of A query frequencies is available: (A_queries.txt, 99KB, text). The following commands will prepare both the A record frequency and AAAA record frequency tables to be joined on the domain name field. Amazingly, the POSIX standard specifies a relational join command that operates on specially delimited text files. The join command below will join the first file on the second field (-1 2), with the second file also on the second field (-2 2). The second field of both files is the domain name. The output of join is then piped to awk to calculate the ratio of A to AAAA record requests. The full list of A:AAAA ratios is available: (ratio_of_a_to_aaaa.txt, 18KB, text). Different domains exhibit a wildly different ratio of IPv4 to IPv6 lookups! Some actually have more IPv6 resolutions than IPv4 resolutions. The mystery is, why is this the case? IPv6 connectivity is important. When removing outliers, there were almost as many IPv6 resolution requests as IPv4 requests. When investigating in more detail, some domains actually receive more IPv6 resolution requests than IPv4 resolution requests. I do not know why. If you have suggestions, please contact me. Part 3 is now up, Bitsquatting PCAP Analysis Part 3: Bit-error distribution. This blog post was originally going to be about domain name distribution in the bitsquatting PCAPs, but I found a problem with my first analysis. The problem has been turned into an opportunity, and now this blog post is about domain name distribution in the bitsquatting PCAPs, and a tutorial on how to determine the distribution yourself! How many unique domains appear in queries directed at the bitsquatting nameserver? Answer: 4271. What is the frequency distribution of queried domains? Answer: long tail; percentages here. A basic familiarity with Unix is assumed throughout this tutorial. While all the commands listed were run on Mac OS X, any sufficiently Unix-y environment should work. and wget because I hate remembering to use "curl -O" to download via the command line. Numerous files named dnslog, dnslog1, dnslog2, etc. should now be in your working directory. These files contain packet captures (PCAPs) of DNS traffic. All of the output should be details about DNS queries. The output format is described in detail on the tcpdump man page. This tutorial is not about tcpdump, I included this step since it is a very good idea to investigate any unknown PCAPs with tcpdump and look for oddities before opening them in more complex tools. Opening files from unknown sources in wireshark can be dangerous. Even though it wont be further referenced in this blog post, the tcpdump utility is extremely handy; I highly recommend reading some tcpdump tutorials for background knowledge. The PCAPs are cumbersome to work with since they are split into several files. To make analysis easier, lets re-assemble all the disparate PCAPs into a single file. There is a tool called mergecap that comes with wireshark that is made exactly for this purpose. The above command will use mergecap in append mode (-a), and save the result into completelog.pcap. Append mode instructs mergecap to simply concatenate the files with correct headers, otherwise mergecap will use packet timestamps to create combined file. The files to merge are given by "gls -1v". Note: gls is GNU ls, it is used because the default ls on Mac OS X does not have a numeric sort option. If you are using Linux just use "ls -1v" in your command line. How many unique domains appear in queries directed at the bitsquatting nameserver? What is the frequency distribution of queried domains ? The answers to both of these questions depend on extracting the query name from every incoming DNS query. Luckily we will not need two write any PCAP reading code; there are many great projects specifically meant for dissecting PCAPs. In this post, we will be using using tshark, the text-only part of the wireshark network traffic analyzer as our PCAP dissector. The above command instructs tshark to not attempt DNS resolution (-n), to read from completelog.pcap as the packet source (-r), and to override the default output format to be the dns.qry.name field of the packet (-o). The tshark utility supports many output formats. The column.c file in the wireshark source specifies allowed formats. It is my understanding that the custom format specifier (%Cus) can accept any protocol filter field. The wireshark Display Filter DNS Protocol reference specifies all filter fields for the DNS protocol. It turns out there are casing issues with the query name field: micro3oft.com and MICRO3OFT.COM are counted as different domains although they are semantically the same. Domain resolution is case-insensitive, but query name case can matter. For instance, 0x20 encoding uses query name casing to increase DNS query entropy. Increasing query entropy makes DNS forgery attacks more difficult. More details can be found in the 0x20 encoding paper. The full frequency count can be viewed here: (requested_domains.txt, 117KB, text). There was a total of 4271 unique requested domains. The left column is the number of times the domain appeared in the query name field, and the right column is the domain. The full percentages can be downloaded here: (requested_domain_percentage.txt, 117KB, text). We have now answered the second question: What is the frequency distribution of queried domains? The domain frequency distribution is a superb example of a long tail. Part 2 is now up, Bitsquatting PCAP Analysis Part 2: Query Types, IPv6.